We created this guide for one reason, to help you find the best scope for your 6.5 Creedmoor rifle. There are a lot of good riflescopes that you can buy online, but it’s hard to get your hands on scopes that are specifically for the Creedmoor. Today, the 6.5mm calibers are extremely popular among experienced shooters as well as beginners. Designed as a long-range target cartridge, used from bolt guns to ARs, 6.5 Creedmoor initially was created from the ground up for competition, though it is deer hunter’s favorite too. While the 6.5 Creedmoor is ballistically superior to the .308 Winchester, it also duplicates or beats the .300 Win Mag’s trajectory with less recoil. It is highly recommended to newcomers as an excellent caliber for mid-range hunting and tactical rifle shooting. Of course, a rifle chambered in that lovely little caliber should be equipped with an appropriate scope to get the most out of it, and for that reason, we created this overview. We don’t want you to go through that, and there’s no reason to as we have collected here the top 10 scopes you can use with your Creedmoor and other rifles. The ease with which you can obtain a scope should not be an excuse not to do research. With the reviews here, all you need to know is in one place. Our proposal from a lower-middle-class price range comes from Vortex Optics, a well-known name in the gun industry for their line of efficient and utilitarian optics and firearms accessories. One of their more popular models, dubbed Viper HS-T (which means Hunting Shooting Tactical), is blending many of the best features from earlier Viper HS and Viper PST riflescopes to match the ballistics of 6.5 Creedmoor ammunition. Vortex Viper HS-T 6-24x50mm riflescope offers a wide four-time power range, making it useful in many shooting scenarios. Both hunters and tactical enthusiasts appreciate Viper`s dual purpose, especially reflected in its 50mm, large objective lens. That bell size is ideal for use in low-light conditions such as at dawn and dusk. Since the 6-24x zoom ranging power needs rather large adjustments, this multipurpose scope is constructed around a sturdy, single piece, 30mm main-tube machined from aircraft-grade aluminum to provide increased windage and elevation travel of 75 MOA and optimal adjustment. The scope's body is argon-filled to prevent internal fogging, and is water-tight and shockproof as well. Furthermore, the scope surface boasts a matte-black, hard-anodized finish, which reduces reflection of the scope body and resists scratching and corrosion. For added benefit, Vortex has applied Armtek coating on the lenses to prevent scratches and stains as well as repel water, oil, dust, and fingerprints as well as to provide low light dispersion and a clear image. As a bonus to the HS-T's versatility is the choice of the VMR-1 reticle that comes with either an option for either MOA or MRAD, with click values of ¼ MOA or .1 MRAD. This utilitarian reticle is a modified duplex of cross-hairs set at SFP and featuring thick outer posts and thin center hairs with hash-marks on both axis for ranging, hold-over, and shot correction. Other outstanding features include the Customizable Rotational Stop (CRS) system, and the side dial for parallax setting, as well as target style turrets with MAG-View fiber optics indicators. With a generous 4" eye relief, the Viper is designed to maximize long distance shooting and ranging abilities. For a 30mm central tube, secure mounting is recommended using appropriate rings fixed with six screws or similar more reliable and expensive mounting systems. However, in this price range, the Vortex Viper cannot be perfect, and issues can be seen with clarity at max magnification. - The clarity begins to degrade substantially beyond 18x, and that fault may present difficulties at dawn or dusk. - Another drawback would be the parallax knob with range indexing that does not correspond to actual distances. - There are also some critics that comment on the stiffness of the zoom ring, so some owners were forced to install a power throw lever. Considering Viper's reticles with somewhat thin cross-hairs that are not illuminated, we would say it is less suitable for hunting at night or dim light, but on the other hand, this will make them easier to use at long ranges. All in all, this is a fine entry-level tactical/target scope and a perfect choice for both beginner and advanced shooters. Granted it's neither a Schmidt Bender nor a Nightforce, but at almost a third of the price, Vortex Viper HS-T is 90% as good as the $2,000 brand names. The Vortex Viper is a powerful scope that’s designed for all weather performance. The scope is compatible with the Creedmoor and other scopes, underscoring its efficiency. The Viper handles recoil well and isn’t gong to fly off even if you use a powerful rifle. For this reason, it’s more practical to use than ordinary scopes. The scope’s optics are clear, giving you a good look at the target ahead. Its zoom feature works seamlessly and provides good detail even if the target is several hundred yards away. Speaking of distance, the scope lets you shoot from up to 1000 yards. While fully capable of hitting from long range, the scope is also accurate in the 100 to 300 yard range. The Viper’s accuracy and range works well with various rifles, in no small part due to its multicoated optics. The scope’s light transmission is 95% so visibility is exactly what you will need for long range shooting and hunting. The scope has a 50 mm diameter lens. This enhances the amount of light that the scope is able to transmit so images are more clear. The scope has a 6.5–20x magnification. If the target is too far, simply zoom in to get a better look. The Viper is made from a single construction piece. This keeps the alignment intact and added durability. The Viper has the Vortex Optics VIP unconditional lifetime warranty. This should give you peace of mind. The scope is waterproof and fog proof. Even if the weather is not agreeable, the scope is able to produce clear images. The Vortex Viper is known for its high end scopes and the Viper is a showcase product. The scope is very accurate, easy to use and its unconditional lifetime warranty is the icing on the cake. The VX 3 is one of the top scopes in the Leupold line, and it shows in the quality. Its 50 mm objective lens has been designed for maximum light transmission and its magnification power is excellent. Compatibility is wide ranging, fit for the Creedmoor and other rifles. The VX 3 also comes with a Twilight Max Light Management System so images appear bright and vivid. When combined with the Custom Dial System (CDS), the Dual Spring Precision Target Adjustments enables you to aim with precision from long range. Another benefit of this scope is its complete range adjustment controls for windage and elevation. The power selector is also within reach. The Leupold has a 6.5-20x zoom power. Armed with this you’ll have the means to rapidly lock in and hit a target. The VX-3 has a 50 mm objective lens. The lens on this scope has been amplified so you do not have to worry about tracking from a distance. The VX 3 is made from tough materials. Unlike other scopes the VX3 can be used in varied temperatures and locations. There is Dual Spring Tension Target Adjustment built in. With this a shooter can fine tune his aim and shoot with accuracy. The scope has the Twilight Max Light Management System. This allows the scope to display colors accurately. The Leupold VX is a powerful scope and lives up to the hype. A lot of scopes claim that they’ve got powerful lens, magnification, compatible with a lot of rifles etc. Well, the Leupold is one product that does exactly that. Bushnell, like many trend-following companies, quickly jumps on the bandwagon releasing its line of AR optics optimized for the 6.5 Creedmoor ammunition. The AR Optics with 4.5-18x variable zoom riflescope has a magnification ratio of 4, like its higher-end brethren in the Elite series. The Bushnell AR Optics 4.5-18X40mm scope with Drop Zone 6.5 Creedmoor reticle is designed to maximize the bullet's performance to place rounds on target out to 600 yards accurately, making it one of the best scope choices for 6.5 Creedmoor rifle capabilities. Its optical system features a modified Duplex style reticle with four tapered posts, and as is expected for this price range, it is located in the second focal plane. The objective lens has a 40mm diameter and paired with fully multi-coated elements, it delivers reasonable clarity and visibility for this kind of scope. This optic is engineered for tactical scenarios featuring tactical style graduated target turrets that allow fast adjustments ranging to 50 MOA for windage and elevation. Also noteworthy is the fast-focus eyepiece utilizing a zoom ring with knurling for a slip-free grip. Built from a durable 1" aircraft-grade, aluminum central tube, the Bushnell AR optics requires one-inch rings to mount the scope to the rail, which are not included. Although the 6.5 Creedmoor loadings generate significantly lower recoil compared to other competitors, Bushnell provides an AR 4.5-18X scope with generous eye relief of 3.7 inches. Disregarding that the AR Optics scope is jam-packed with features, the riflescopes from that price class have a few drawbacks. - The adjustment knob was very stiff with approximately one minute of difference between the original zero and the return to zero, which is not ideal. - Another complaint refers to the product manual since Bushnell does not ship any documentation with the AR Optics scope. - In the end, though the scope has a small window to read what hash mark you are on, the problem was there was never a hash mark lined up within the window. Besides being a favorite of the long-range shooter, due to its waterproof and shock-resistant features the Bushnell family of AR Optics is also popular within hunter's population. The optics manufacturer, Barska, has built its reputation by launching a wide variety of usable, working and, above all, affordable products. Barska entered into our selection of the best scopes for 6.5 Creedmoor rifle with its model 6.5-20x40mm IR Tactical Riflescope, which offers some of the most sought-after features in the budget-friendly set, such as green illuminated Mil-Dot glass etched reticle. Until now, it was unimaginable to find a scope featuring a reticle positioned in the first focal plane (FFP) under $300. The Barska 6.5-20x Tactical riflescope with a FFP reticule allows shooting at longer ranges and using hash marks on the reticle to compensate for trajectory drop to make a real difference to your shooting with 6.5 Creedmoor. Though a standard feature of the riflescopes with much expensive price tag, the Barska 5-20x scope also utilizes a target-style windage and elevation adjustment knob. Barska Tactical Riflescope applies Accu-Lock system which allows the scope to stay locked dead-on to the target shot after shot. As an extra benefit, it has fully multi-coated optics and comes with a side parallax adjustment located in a turret-mounted focus knob. This optics sports rigid, high-grade alloy, 1-inch monotube construction that provides high recoil and shockproof capability with much larger calibers than 6.5 Creedmoor combined with an all-weather construction. As bonus accessories, the Tactical Rifle Scope comes with 5/8-inch set of Weaver-style, see-through, mounting rings. While the Barska 6.5-20x40 IR is a good introductory front reticle scope, it has issues as would be expected from an item at this price point. - The first complaints are about the very small eye relief of only 3.2 inches, and the other more serious complaints refer to the appearance of bubbles in the lenses between 10x-14x magnification. - In the end, with a body length of 16 inches it is a little too long but still fits well on an AR15 platform rail. Leupold's wide variety of optics guarantees you can find the best scope for a 6.5 Creedmoor rifle and the leupold VX-3i LRP 6.5-20 x 50mm just fit the list. Leupold has released their new line in 2017, a VX-3i LRP scope; i- stands for Improved and LRP for Long Range Precision. LRP is a line of scopes that are not purely tactical but certainly more target shooting oriented and is probably the one of the best scopes we would opt for on a rifle chambered, 6.5 Creedmoor. Regarding the 6.5 Creedmoor's long-range potential, the option to choose a first focal plane (FFP) reticle instead SFP (also available), as well as the choice to have MOA or Mil-Dot turret controls with corresponding reticles will make VX 3i LRP one of the best scopes for 6.5 Creedmoor when it comes to long range shooting. While the VX-3i LRP features enlarged turrets, the elevation knob with a Zerostop and travel indicator feature is the most pronounced knob, and the size of it draws all of the attention. The windage dial is smaller than the elevation knob and it has a cover to offer protection that can be exchanged with the thread protector that is included. On the opposite side of the windage control is the adjustable objective or side focus knob. An enhanced magnification ring with a throw lever that comes included makes it quick and easy to make magnification changes and the movements are natural from behind the scope, and easy to use even with gloved hands. The LRP scope offers plenty of eye relief with 4.41” at low and 3.62” at high magnification numbers. A large, 50mm objective lens combined with a Twilight Max Light management system allows the scope to display colors accurately and lets you hunt longer, as it ensures sharper images in low-light conditions. VX-3i LRP 6.5-20x is utilizing the latest optics developments from Leupold such as Diamond Coat 2 and Argon & Krypton waterproofing, but the quality of the glass itself is perhaps not to the same standards of their top of the line Mark 8 series of scopes. The scope is machined from a solid, one-piece, 6061-T6 aluminum tube and has an overall matte black, anodized finish. With its 50mm bell housing for the forward objective lens and 30mm central tube, our recommendation is to use medium height, 30mm Dia. Rings to mount the scope. - As a drawback, the scope is somewhat heavy with a weight of 21.7 ounces. - Although Leupold incorporates many advanced features into the LRP line, it does not have an illuminated reticle. At length of 14.5 inches, Leopold's LRP is a large scope, but it is not the size of many of the top tier tactical scopes that are found on the market today. On the other hand, this scope packed full of features and the complete range adjustment controls are more suited for advanced shooters than for the novices. Weaver’s 40/44 Varminter is built expressly for taking out varmint, and this is evident from the way the scope has been constructed. It mounts on the Creedmoor with ease, and this is matched by its recoil handling. Even if you fire a powerful rifle, the scope won’t wobble. The Varminter has a lot of strong points, not the least of which is its multicoated lens. The end result is high light transmission and clarity. Because the optics is clear and there’s excellent magnification, you’ll get clearer views. Once you’ve locked the target, it’s just a matter of taking your shot. The Varminter makes it easy to adjust settings if necessary. In addition, the scope is fog proof and waterproof so you can feel confident about taking the scope when you go hunting. A common complaint with some scopes is they fog up, so it is good to know that’s not a concern here. The Varminter has an adjustable objective. With this feature a shooter will have a simpler time locking in on a target. The scope is made of 1 inch, one piece construction. This reinforces the scope’s strength so it’s more suited for extensive use. The Varminter is nitrogen purged. This is the process that keeps the scope from fogging up. The Varminter has multicoated lens. This enables the scope to transmit as much light as possible. The scope has a 6.5-20x magnification. The magnifier has been enhanced so a shooter can see a lot more detail. The Weaver scopes are known for quality and this model highlights all the good things about it. The scope is engineered to precision and it is as good for varmint hunting as it is for shooting. The Weaver is a powerful riflescope that’s been designed for the shooter who does not want to compromise their accuracy. It fits the Creedmoor very well and is also compatible with most types of rifles. Its recoil handling is also one of the best in its class and very appropriate for powerful rifles like he Creedmoor. All good scopes have a powerful lens and zoom, and the Weaver is no exception. With its 6.5-20x zoom, you can acquire a target from hundreds of yards away and hit the bull’s eye. The scope operates smoothly, so even a new rifle user will notice improvements in their accuracy. The scope is shockproof, waterproof and fog proof, three essential elements the serious shooter looks at. These features are complemented by its Dual X reticle which further simplifies acquiring of targets even if the object is several hundred yards from you. The scope has a 44 mm objective lens. The lens has been enhanced so there is greater visibility. The Weaver has a 6.5-20x magnification. 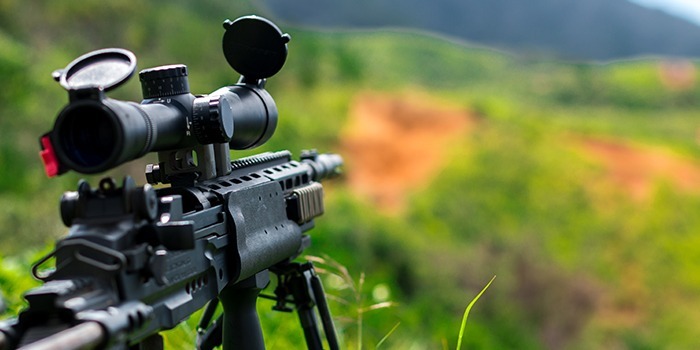 By zooming in a shooter can track and lock in on a target without making major adjustments. The scope is shockproof. For a shooter this is very important as it means the Weaver can be used in various situations. The Weaver is built from high quality materials. It is in one piece so there is no risk the scope will snap in two. The scope is has been nitrogen purged. This is what gives the scope its fog proofing capability. The Weaver is a very good scope, powerful enough for long range shooting and big game hunting. Its precision and engineering and durability means it’s appropriate for heavy usage in rugged locations. Do you need a scope that’s suited for night use? Then the Photon should be on your list. As the name makes clear, this is a night vision scope but it’s just as effective during the day. Designed for the 6.5 Creedmoor and other rifles, the Photon is constructed for the shooter who wants quick and easy target acquisition. The scope’s zoom power is higher compared to the average scope. This is further enhanced by its 50 mm which captures light at a higher rate, so images appear clear, sharp and vivid. The scope’s digital reticle has half a dozen options including for crossbows, a German type reticle, mil dot and varmint. Whether it is for range finding, 350 FPS crossbows or hog hunting, the Photon has a reticle for you. With its video output it’s also easy to make captures. The Photon has an enhanced objective lens. It is more enhanced than the ones used on the average scope so there is greater visibility. The Photon’s magnification is at 6.5x. For a shooter this means being able to lock in the target quickly and with precision. The scope has a 780 mm IR laser illuminator. This is what makes it easier for a shooter to aim and shoot. The Photon is designed with versatility in mind. The scope’s clarity enables a shooter to use this day or night. The Photon is made from durable materials. Even if used in rugged conditions with varied temperatures, the scope holds up. The Sightmark Photon is one of the more versatile scopes the brand has come out with. From its resilient built to its excellent range, the Photon is truly an all around scope. If you don't want to pay a significant sum of money for less sounding names, then your choice falls on several brands, and legendary Zeiss is certainly one of them. The Zeiss Conquest series belongs to the higher end of the mid-tier level of optics, designed for sportsmen and especially hunters, and is available with hunting or target turrets. Built from German components and assembled in the States, the Zeiss Conquest features a rugged, 1-piece main body tube construction with a level of durability and all-weather resistance natural to optics of this caliber. This high-performance riflescope is the biggest one of the Conquest line offering a large magnification range of 6.5-20x. With that power range, it is an ideal optic for varmints or precision shooting in large, open spaces, making this scope 100% compatible with the 6.5 Creedmoor rifle. The Zeiss scope features a very consistent turret system with 1/4″ clicks combined with Zeiss parallax control (Adjustable Objective AO). It has permanent 3.5-inch eye relief regardless of magnification, which makes this scope superior to every other scope in this price class. Zeiss Conquest Rifle Scopes come in a broad choice of reticules located in the second focal plane and our model with the Rapid-Z 1000 ballistic reticle gives hunters that go for long ranges an advantage with precise aiming, and a holdover that is accurate for shots at extended distances without complication. The Conquest lineup features lenses with proprietary Carl Zeiss MC multi-coatings on all glass-to-air surfaces and a mechanical erector design unique to this price class, which reduces stray light. - Actually, Zeiss has to offer riflescopes with lower prices, and this was made in a very cost-effective way by reduction of scope`s main tube diameter from 30mm to 1". As a benefit, customers will save money on rings because the scope tube is 1" not 30mm. - But, as an unfavorable result, Zeiss Conquest scopes are lacking a couple of minutes into the twilight hours. - Although Zeiss incorporates many advanced features into the Conquest line, it does not have an illuminated reticle. This scope is a little bit overpriced, but otherwise, the Conquest line is known as "Zeiss for the masses", and that comes from Zeiss' strategy to become more competitive in the US market. Other than that, the Conquest 6.5-20x50 AO MC mount on the 6.5 Creedmoor rifle provides an ideal combination and an unrivaled experience. We have read a lot of riflescopes reviews online and find them wanting. Usually they just repeat the info and specs found in online retailer sites without giving you information about how the scope works. That is one area where these reviews differ from the rest. We have divided the reviews into features, pros, cons and verdict, similar to others. However, we go into detail explaining the purpose of each feature. We also explain how these features work, how the scope functions in different environments and so on. We made it a point to cover everything. We also made certain the reviews are written in an easy to read manner. We put emphasis on how the scope works. We avoided the technical stuff and concentrated on the practical side and how the scope performs in real life situations. We also did in depth research about each scope. One question you’re probably asking is why is it so important to have a scope that’s designed for the Creedmoor? There are a lot of other riflescopes so does it really make a difference? Yes it does. A riflescope that has been made for the Creedmoor will be easier to use. The reason is the specs and mechanism are fit for these rifles. Many of the problems that you come across such as inaccuracy, wobbling, shaking and so on will be eliminated if your scope is built with compatibility. The other benefit of these scopes is they’re equipped with the features that your rifle needs to provide the best results. The features you’d expect like high quality optics, fog proofing, waterproofing and magnification are often integrated. In other words, there are a lot of reasons why you should get one of these scopes. These riflescopes made our list because they are 100% compatible with the Creedmoor. However, we also had other guidelines that were used. Longevity: how durable is the scope? Is it waterproof and shockproof? These are crucial if you’re using the scope for hunting. Usability: we refer in particular to how easy the scope is to tweak. A shooter needs to adjust the magnification, parallax, zero in and so on. The easier the scope is to adjust the better. Range: some scopes are only good for short range shooting, while others are for long range. We chose scopes that can do both. Reliability: you’ll be using the scope for long stretches, so we made sure these scopes are for heavy duty use. Brand: brand name matters no matter what you’re buying. This of course, applies to rifle scopes. If you own a Creedmoor or plan to buy one, these scopes will be ideal. These scopes also work with various rifles too so it should suit those other users as well. Those who want a scope that’s good for all-weather use. Those who need an accurate scope. Those who need a durable and waterproof scope. Those who want scopes with long warranties. Scopes are integral for any rifle, and that applies to the Creedmoor. Without a good scope you’re not going to go far when it comes to shooting accuracy. While it’s true that you’ll find a lot of brands online, it’s easy to get confused as they will all claim to be the best there is for your 6.5 Creedmoor. That is why we believe reviews are very important. By narrowing your options to just ten, you can choose the product that’s most compatible with your scope. If you don’t read reviews and just focus on the ads, you won’t be able to get all the facts. What we have done here is provide the facts that buyers need to know. And if you’re wondering which is the best scope for 6.5 Creedmoor rifle? All ten of them are very good and capable. Whichever you choose, you’re going to get good results.